The Envirobiz Group has released the 2011 average national gate rates for the disposal of municipal solid waste at landfills in the United States. The national average in 2011 reached $45 ($44.91) per ton. The 2011 average national rate was $1 ($0.97) per ton higher than in 2010. Note: Copyright 2012 by The Envirobiz Group. The copyrighted graph and statistics on this webpage may be used condition on the citation of The Envirobiz Group as source of data. The Envirobiz Group statistics are based on a nationwide survey involving over 90% of the currently operating landfills disposing of municipal solid waste in all 50 states. The national median price amongst the survey landfills was $40 per ton; the fact that the median is less indicates that the overall survey group had lower prices than reflected by the median. The 2010 median gate rate at landfills for MSW disposal was also $40 per ton. 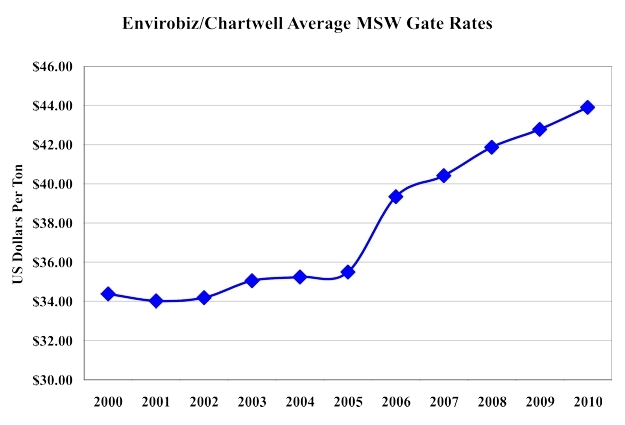 The Envirobiz Group's Chartwell Division has been surveying and compiling gate rates at MSW landfills since the early 1990s. Smaller groups of landfills were surveyed in 2004 and 2005 by Chartwell's previous owner; the surveys probably did not identify some of the price increases that happened. Both the national gate rates for disposal and the change in the national average gate rate per year are most often different than what has happened in individual states during the time period of 2000 through 2010 and even between 2011 and 2010. Envirobiz/Chartwell provides state specific pricing trends in State MSW Pricing Reports. Likewise, within a state, there are also sometimes major differences between landfill gates rates with major metropolitan and rural areas. For purposes of helping clients understand such regional differences, Envirobiz offers Regional MSW Pricing Reports. This report is a confidential work product intended for the private use of the client, any public distribution of the report or its contents requires the advance written approval of The Envirobiz Group.